Well, today I am So Thrilled to share the Brand New, Super CUTE Oh Snap! stamp set & separate Brand New coordinating Oh Snap Camera Dies too, concepted by our Very Own Uber talented Shelly Mercado! Yay! Way to go Shelly!! ;-) I also paired these darling sets up with the Brand new Banner Stacklets 2 Dies, the New Film Strip Border Die and the Awesome New Chevron Cutting Plate too! OMGoondness, I had Soo Much fun with this Super CUTE Set!! 8-) I can see myself reaching for this one A LOT in the near future!! It's So Fun, Whimsical and CUTE!! And I LOVE all the Fun camera images and the Great selection of sentiments too! It Definitely makes this one Versatile set! Gotta Love that! 8-) I stamped my Adorable Oh Snap! Camera with Memento Tuxedo Black onto Choice Snow White CS & colored it up with my trusty Copics. I cut it out with the Cool Coordinating Oh Snap! Camera Dies and popped it up with a bit of foam tape. My Mats and BG layers were created with Lakeshore Bazzill CS, Kraft CS, the Brand New Banner Stacklest 2, Some Fun dp's from Pebbles Seen & Noted 6x6 collection, the Brand New Chevron Cutting Plate and the Brand New Film Strip Border Die too! Shannon, your card is awesome! I'm lovin' the Chevron background with the dp and how you used the Film Strip die behind the camera. And heeeey...that GREEN camera is my favorite!!! Hugs! Oh my, this card is calling my name! I love love LOVE the chevron die-cut background where you swapped out the negatives with dsp - one of my very favorite things to do with a die like that! What a fantastic look and card! I love it all!! This is fabulous, Shannon! I love what you did with the chevron bg, and your coloring rocks as always! This is sooo FUN! Adorable card and I love that sentiment! Your coloring is always "snappy!" Your color choices are wonderful. Oh, snap! Another fabulous set! Love your sweet card Shannon. That camera is super cute. Love teh 'paper-pieced' background. The teal color looks great with the designer papers. Just darling, Shannon! Love how you combined the chevron cutting plate and the film strip! Super sweet and fun! Oooo! 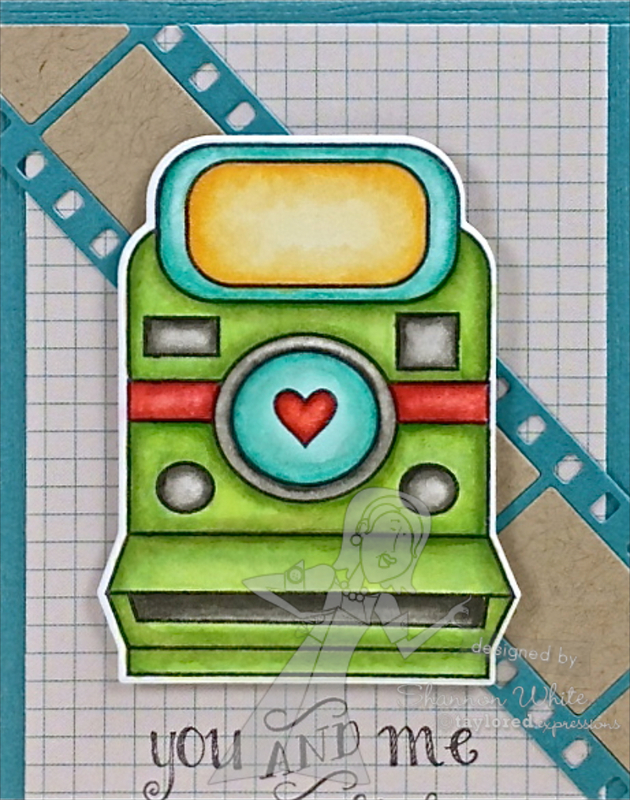 Love the new Chevron Cutting Plate and the film strip border die! This card is delightful! Oh my gosh, you are so right! This is soooo cute! I love the colors you used. I gotta head over to get these!!!! LOL! I still have my polaroid but not sure they even sell film for it anymore! All your die cuts are gorgeous and how you fill them in is so pretty. CUTE camera and sentiment!!! Love the chevrons on here too. This is totally adorable Shannon! I love your color choices...and the awesome layout! Snaps!! DARLING card and I LOVE the film strip, Shannon! Wow! Fantastic dies and a super cute image Shannon. Great card! Hugs! Wow! What a fabulous piece of work! Love the camera, papers and design. It all fits just beautifully. Great sentiment to go with the camera, too! Great card! Love the film strip! Another adorable card Shannon!! I love these fabulous die cuts! THis is just adorable, Shannon! !